Did you know that dental implants date back into the days of the Mayan empire? After researchers discovered an ancient skull in the Honduras, they found dental implants created from seashells to replace teeth. Since then, archaeologists have discovered teeth made of gold, silver, and ivory in the mouths of Ancient Egyptians. But what happened to get us from one point of hammered seashells in our mouths to the modern titanium posts that naturally fuse with our bodies today? Fortunately, an osteopaedic surgeon named Per-Ingvar Bränemark was interested in the healing process of animal bodies and experimented on rabbits. While studying the process of healing and regeneration, and he inserted a titanium post through a rabbit’s leg and studied those results. To his surprise, the post couldn’t be removed a few weeks later when he tried to take it out. He realized that the bone had naturally fused with the titanium! This study was then applied to dental technology. In fact, Bränemark placed the first dental implant in 1965 in a live human volunteer! Back in 1951, a small group of dentists that had practiced successfully placing dental implants all came together and created the American Academy of Implant Dentistry (AAID). This group focused on spreading their combined knowledge about dental implants and helped make advancements in dental implant placement even still today! Nowadays, patients don’t have to worry about having bamboo shoots surgically placed in their jaw like in ancient China. We have advanced dental implants created from biocompatible titanium. These small implant posts change people’s lives for the better by replacing teeth from root to crown for a natural looking and feeling tooth replacement. 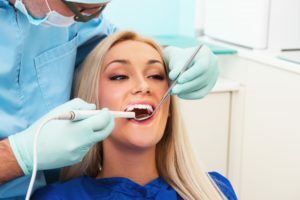 If you’re doing research before moving forward with getting your dental implants, you’re on the right track to finding the best implant dentist in Annapolis. Our team of professionals, Dr. Earl L. Chambers III, Dr. Cibele L. Raimondo, and Dr. Beverly A. Jimenez bring unique experiences and knowledge to provide comprehensive care for any type of patient with any level of tooth loss. We’re able to offer top-notch dental care all under one roof. If you have more questions about dental implants, feel free to call and speak to one of our friendly team members.